March 21 is National French Bread Day. You can celebrate this day by baking French bread at home. France is known for its kinds of bread, but one of them has become iconic. This is baguette, that is loved for its crusty crisp and soft crumb. Shape, length and even dough recipe is regulated by French law, that is why baguettes never change their taste. Did you know that baguette was not an iconic French bread before the beginning of the 20th century? Earlier bakers worked at night so the customers could enjoy fresh bread in the morning. A new law passed in 1920 prohibited the shifts starting earlier than 4 am. This made French bakers difficult to make fresh bread ready for customers early in the morning, that is why they turned to the fast-baking baguette, which soon became a part of the daily life. 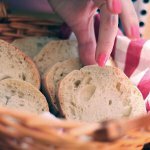 Although baguette is one of the most popular French breads, there are also different types of bread, that include batard, fougasse, croissants, brioche, boule, ficelle, pain de campagne, pain de mie... Celebrate this day with a loaf of fresh French bread to share with your family.